It's easy enough to go online or walk into a shop and part with some cash for a pair of speakers, but are they the right speakers for you? How do you choose the right speakers? The all-too-seductive urge here, of course, would be to head over to our Awards section, research the most expensive Award-winner you can afford, and buy them. After all, if it’s the best we think you can buy at that price, doesn’t it follow that it’s the best for you? Well, perhaps. But take care. After all, take that approach to house or car buying, for example, and you could find yourself commuting from your 10-bed mansion in the Highlands of Scotland to London every day, in your McLaren F1. Not an ideal scenario for most people. There’s a distinction to be made between the most and, in a more personal sense, the best you can get for your money. Having said all that, the biggest decision at the start of your speaker-purchase journey does of course concern how much you’re willing to spend. There are some obvious and, hopefully, a few not-so-obvious points to be made here. For instance, you’ll hugely narrow down your search if you establish your budget before seeing what’s out there, rather than the other way around. You also ought to think about where that budget needs to stretch most. If you are buying a whole system, there’s no point spending 90 per cent of your money on the speakers, only for them to shine an unforgiving light on all the flaws further up the chain. Likewise, if you currently own a system you bought for next to nothing at a car-boot sale, that grand burning a hole in your pocket might not be best spent solely on a pair of stunning floorstanders. Take care, though. While frugality and prudence are all very well, there’s also a degree of future-proofing to be considered. If, for example, you are planning soon to upgrade other components in your system, you may have cause to reconsider your budget to allow for speakers with the sonic stretch to reveal those upcoming improvements. With a little foresight, shelling out a few extra quid now could save you money in the long run. The next crucial task is to measure your listening room. The space available to you may require or restrict you to a certain type of speaker, and it should narrow your search in terms of positioning. Most speakers require a degree of free space to perform at their best, so if you can fit them in only close to the wall, you'll need to consider that during your search. This needn’t impact the quality of the product you end up taking home – there are plenty of sonically tremendous speakers that won’t mind their backs up close to the wall, such as the Wharfedale Diamond 220s and Q Acoustics 3010is. Just remember you’re dealing with sound waves that will be affected by whatever they encounter at whatever distance. If a manufacturer suggests you need two metres between its speakers and a wall, it's best not to push your luck. Next, think about what type of speaker will suit you best. 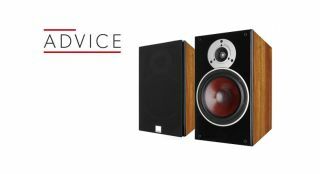 You’re going to be looking at either floorstanders or standmounters, sometimes referred to as bookshelf speakers – names that are generally descriptive of their stature – or possibly a subwoofer/satellite combination, pushing the lower frequencies through a sub in coalition with a more easily accommodated pair of main speakers. As a general rule of thumb, bigger speakers tend to be capable of delivering higher volumes, better dynamics and more bass, though you shouldn’t assume that rings true with every product – it’s all relative. Further to that, have a think about the volume at which you’re actually going to be playing your music. Are enomously powerful floorstanders going to be wasted on you? Are those charming little bookshelf speakers going to breathe sufficient life into your party? Many speakers sport four terminals for you to connect your speakercables, giving you the option of biwiring. With a single set of cables, all frequencies are propelled toward your speakers together. If you biwire using two sets of cables, your amp can drive upper and middle/low frequency signals separately, wiht the aim of a purer sound with superior precision. It may be the case that your amplifier won’t accommodate biwiring, or simply that you aren’t interested in doing so. If you want to connect using a single wire to each speaker, they come with conductive links between each pair of binding posts, so your music will still reach each driver. But it’s worth bearing in mind that a speaker with only two connectors will remove biwiring as an option in future. You also have the option of passive, active or powered speakers. Most speakers are passive – all the power used to make them work comes from your amplifier, with the speakers directing the signal to their separate drivers via a crossover. In a powered speaker, on the other hand, the signal is amplified inside the speaker cabinet, which means the speaker itself requires a separate mains feed. There is a difference between a 'powered' speaker and an 'active' speaker. A powered speaker has its amplifier built in, but is running the signal through a passive crossover. That is to say the signal is amplified before being separated into frequency bands and fed to the drivers. With active speakers, however, each driver is fed by its own amplifier. Because, therefore, the crossovers work at line-level rather than speaker-level, you can use more accurate components, and therefore calibrate with more accuracy. The main downside of this isn’t so much the cost - powered speakers are more expensive at first glance, but you are, of course, buying the amplification to go with them, so they can turn out to be better value for money than a separate speaker and amp combo. It's more that, if you want to upgrade your system in the future, you’re going to have to do so with the whole thing. That’s where you may end up spending more money in the long run. We usually find better sound can be accomplished more easily using separate components – a source, amplifier, good cables and interconnects, and a separate pair of speakers – but powered/active speakers, if done well, are an obvious exception. The separates solution doesn’t suit everyone, so if you haven’t the space or desire for multiple boxes in your living-room there is a wealth of gifted powered speakers for you to peruse. Another word on power: though it's less of an issue now compared with the days of valve amplification, if your speakers are demanding to drive you’ll need a suitably muscular amplifier to support them. Don’t look only at the headline power figure - see what happens when the impedance drops to four ohms. If the number nearly doubles, then your amplifier has good current delivery and will be capable of driving more demanding speakers. At What Hi-Fi? our star ratings are based almost exclusively on a sound-for-pound basis – but that isn't all that matters to people, of course. No matter how great you think a pair of speakers sounds, if you can’t stand the sight of them you aren’t going to want to spend hours sitting in the same room. As well as making sure you like the way they look in your room, you might want to think further about the environment you will be keeping your speakers in. Tweeter protection, in particular, is an important consideration, especially if you have small children, or a particularly inquisitive cat, say. Metal domes, especially, tend to attract small fingers and paws, and dent easily. Thankfully, some speakers come fitted with tweeter grilles so you can have the protection but still admire their design.